Thomas E. "Buzz" Daniels, Jr. 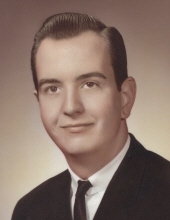 Celebrating the life of Thomas E. "Buzz" Daniels, Jr.
Obituary for Thomas E. "Buzz" Daniels, Jr.
Thomas E. “Buzz” Daniels, Jr., 70 years, of Slatington, died Thursday January 17th, 2019 at Lehigh Valley Hospice in Allentown. He was the husband of the late Regina (Jones) Daniels. Born in Allentown, he was the son of the late Thomas E. Sr. and Remola (Andrews) Daniels. Thomas worked for many years in the printing industry before retiring. He was a 1966 William Allen High School graduate. He enjoyed horses, beagles, hunting, NASCAR and crafting. He is survived by his three sisters. He was preceded in death by his wife and twin daughters. Graveside services will be held at 11am Tuesday January 22nd, 2019 at Fairview Cemetery, 2584 Lehigh St. Whitehall, PA 18052. Brubaker Funeral Home, Inc. of Catasauqua are in charge of the arrangements. To plant a tree in memory of Thomas E. "Buzz" Daniels, Jr., please visit our Tribute Store. "Email Address" would like to share the life celebration of Thomas E. "Buzz" Daniels, Jr.. Click on the "link" to go to share a favorite memory or leave a condolence message for the family.